The minister said he would not compromise on his view that such fees are too high. Minister Simon Harris today at the launch of the report. 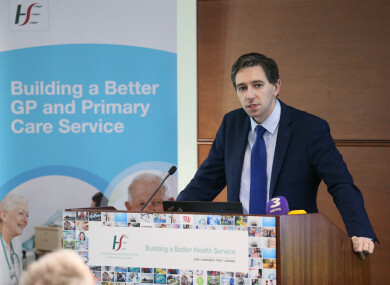 HEALTH MINISTER SIMON Harris has said fees of €55 or €60 to see a GP are too expensive. A new report on GP and primary care services, which will help inform negotiations for the new government GP contract, found the cost of seeing a GP deterred one in three patients from making an appointment at their local clinic. Harris said accessing primary care cannot just be about those on medical cards, stating that it has to be about affordability. I am willing to discuss it with GP representative bodies about how to best make it a reality, but I am not willing to compromise on that fundamental tenet that the €55 or €60 is too expensive for many people, who as the Taoiseach would say, ‘get up early in the morning’ and go to work. I don’t want parents worried about being able to access primary care, so we do need to look at that as we have our discussions. While the minister would not be drawn on a specific price point for GP fees he would like introduced, he said he could understand why some representative bodies have concerns about the roll out of free GP care. “I will not compromise from my perspective or point of view that parents having to fork out €55 or €60 to go to the doctor – that is an acceptable level,” he said. While the minister said he did not want to negotiate in public, but options being considered include the idea of co-payments, where a person can partly contribute to pay the fee as well as people perhaps getting a certain number of visits to their GP each year. “It [Slaintecare] talks about low-cost or no-cost services, we have co-payment in relation to the pharmacy and drugs or indeed a certain number of visits per year – these are all things we can look at but the current system is out of kilter with a lot of international best practice,” said Harris. He said he is “frustrated” the discussion surrounding primary care only relates to people who have medical cards. The new plan for Slaintecare wants everyone to have access to primary care, he said. It’s understood an agreement could be reached with GP representatives in the coming months with changes taking effect during 2018. The minister said he expected GPs to be providing new services over the course of 2018, with more services being rolled out on a continuous basis every year following. He added that there needed to be “honest, frank and constructive” discussions about “modernising” the contract, which hasn’t been updated in the last 40 years. The role of the GP in the 21st century has to be the central focus, said Harris, who pointed out that many doctors have said they are willing to do more. Out-of-hours services are also up for discussion, where there will be a focus on what are “working hours” and what are “out-of-hours”. “I think we need to ask ourselves a very honest question – what is ‘out-of-hours’ in a world where people are working longer and working anti-social hours, quite frankly. People are spending more hours on the move. So surely out-of-hours is a term in itself that needs to be reviewed,” said the Wicklow TD. Far too many people have pointed out to me that we have very fine primary care centres around the country that find the lights turned off at five o’clock in the evening. That is not a good use of taxpayers resources and that leaves people with nowhere else to go but the hospitals. The benefits of shifting to primary care are clear in this new report, he said. The new report, commissioned by the HSE, and produced by researchers at the Department of Public Health and Primary Care at Trinity College Dublin, finds that half a billion euro a year in funding is needed over 10 years to move to a GP and primary care system. It also found that 90% of people surveyed were satisfied with their last GP visit. Over 6,000 people provided feedback for the report making this one of the largest engagement initiatives undertaken by the HSE. Email “Health minister says the €60 price tag to see a GP is too expensive ”. Feedback on “Health minister says the €60 price tag to see a GP is too expensive ”.